Sharon made a comment in my last post about something I've observed too; that many weavers are staunchly defensive about their warping method! This is akin to another "controversy" which exists amongst spinners: Scotch tension versus double drive. It is oddly amusing that flame wars develop over these things, especially considering that when one examines a length of handwoven cloth, or a skein of handspun yarn, it is impossible to determine through observation alone what method of warping or type of wheel was used. "I want to weave as well and efficiently as possible. I want to weave without the anxiety that a disaster can occur at any time. If problems occur, I want to know how to fix them." That's me too. And that's why the discussion through blog comments is so helpful to me. I like to receive feedback and hear what others do in a similar situation. Questions make me think things through carefully. This is what helps me grow as a weaver. While I can't offer any definitive answers to all the world's weaving problems, I can tell you about my own journey, and why I switched from front to back, to back to front warping. "In the first book in this series, I wrote that 98 percent of a person's time is spent actually realizing and enjoying the goal. It has always made sense to me to learn to enjoy the 98 percent -- in weaving and in life." This gave me pause, as I realized that while I loved weaving, I didn't enjoying warping. So when I next dressed my loom, I started at the front of Peggy's book and worked my way step by step through to a big mess. Literally. I'm not sure whether it was the kitestick or the raddle that ultimately did me in, but I finally reached a point where I threw up my hands and said "forget it." Without another thought I went back to f2b warping. I did keep one thing from that experience however, lashing on. Tying all those knots onto the front apron rod always seemed like too much work to me, especially as adjusting the individual knots to even out the tension was particularly frustrating. Lashing on made it easier for me to adjust the tension, even after I'd started weaving the header! 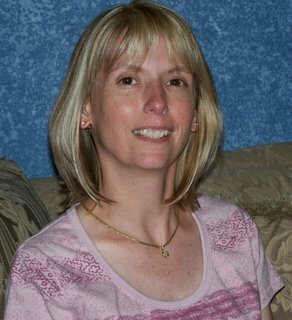 That was about 5 years ago. That experience however, did make me more curious about why some weavers preferred the b2f method, so I started to ask them about it. It seemed that the top two reasons I heard was either because that was the method they first learned, or because it gave that particular weaver excellent tension. Now, we all know that a perfectly tensioned warp can also be achieved warping front to back too, but considering that tension continued to be a big problem for me, I decided to let this argument sway me and give b2f another go. This time I researched the topic with all the resources I could get my hands on. I finally chose to try Deb Chandler's method from Learning To Weave. I think one of the reasons for my previous failure, was that I was trying too many new things at once. Deb's b2f method was more similar to how I was already warping. That b2f warp, done last May, was a success. I've been working on fine tuning my process ever since. I have to admit however, that while better tension is the mark of it's ultimate success for me and increases my enjoyment of warping, another reason ultimately sold me on the process. I found that because the way my Schacht Mighty Wolf is constructed, I could see both warp and heddles better and thread the heddles more easily with my bifocals! Neither a very romantic nor powerful argument for most of you, but for me it meant no more cranking my neck to get that thread through the heddle eye! * Rings to hold lease sticks - yes, a keeper. 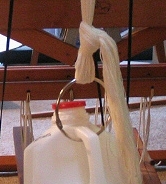 Initially, these replaced shoe laces when I first used them to attach my warp to my milk jug weights. I have since replaced the rings as milk jug holders with s-hooks, an idea I got from your comments and visiting your blogs. * Lease sticks left in warp - yes, this is a keeper. It's value is seen when a warp end breaks or when it's time to tie on a new warp. I don't always use my large clunky lease sticks; it depends upon the warp. I do like the holes in the ends of them however, especially in using the rings to hold them together. * Leaving the raddle in while weaving - maybe. I'm still undecided about this. Marie's and Sara's comments about jack looms were very helpful to me and I want to research this more in the future. So, there you have it for the moment. As it is, I'm now very happy with back to front warping. 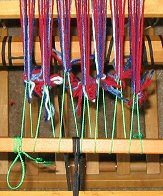 Not only is it more comfortable for me with my particular loom, but I like that the warp only travels through the heddles and reed once. Not sure if this actually preserves the warp any better, but it is a factor. If any of you have other reasons why you prefer your warping method, I'd love to hear them. What is the size on your s hooks? I just got caught up on your entries. I've enjoyed reading your thoughts on warping methods. I started B2F, went to F2B, but came back to B2F for many of the same reasons. I still use F2B occasionally, especially for shorter multiyarn warps. Thanks for the Summer and Winter recap. 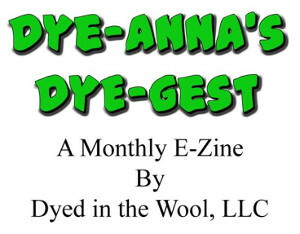 I got so far behind that I didn't even warp the loom for samples until the last day of March! I haven't gotten comfortable with b2f, though I have all the equipment, books, etc and plan to try again. For now, because I mostly use my handspun and the warps are short, I enjoy f2b. I really do enjoy dressing my loom, even more than weaving! Laritza, I bought the 3 inch s-hooks from Home Depot. I noticed there was 2 kinds, one with a more curved s and the other with a straighter s. I got the curved kind as I didn't want anything falling off! Thanks for stopping by my blog. I can not find 3 inch S hooks here in Utah. Where did you buy them? That's what I figured was up, but just wanted to check. I saw you were still posting here and figured the kitties must be okay. The Meezers posted that there is a missing torti in Austrailia. I hope she's found soon...she's very pretty. It is funny how people usually stick quite firmly to their first method of warping. One of my reasons for b2f is because of less loom waste. Right now on my Dorset is another hand spun scarf and I will have less then 5 inches of loom waste. Thanks for the list of tips. They are good ones!